Squash House Quilts: Snail Mail Surprise! First I want to tell you about a terrific giveaway Terri is having over at Purple and Paisley! It's her birthday tomorrow and also the one year anniversary of her blog! She's having a giveaway every day this week, so please go over and wish Terry a Happy Birthday/Blog Anniversary and join in the fun! This is what first came out of the envelope. The little bird is adorable and will be the first ornament on my “studio tree” in the Squash House! Terri sent me an angel a while back, which will go on top of the tree. 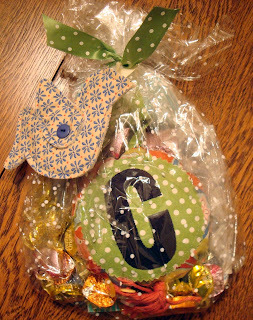 Inside the package was the cottage block and some Dove chocolates and Werther’s candy! Every quilter loves chocolate and Mr. Squash?....well he’s a big fan of Werther’s! 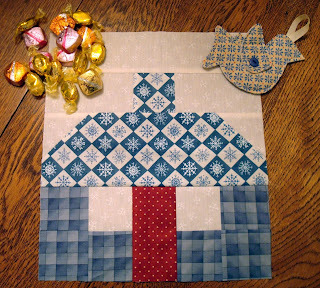 Check out the cottage block – perfectly made and so adorable! I love how Mel did the roof and chimney! Next is a really neat door hanger with my first initial on it and a stitched note which she says to “hang it somewhere where you will be reminded to take time out of each day for yourself”. I certainly will live by that and it will hang on the door to my studio! But wait….there’s more! 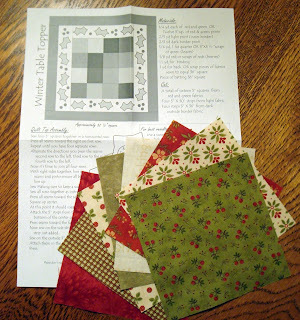 She included 8 charm squares and her own pattern to make a holiday table topper! I told Mel those are just the fabrics I would buy for myself and I was beginning to sense some “Quilter’s ESP”!! 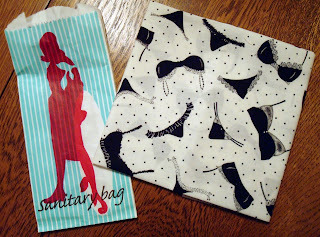 And finally, out of the package came a Sanitary Bag – huh? 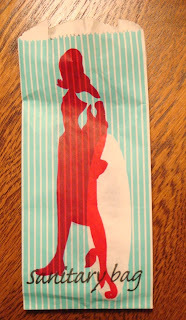 But there was something inside – this fabulous, funky fat quarter! Oh, what a hoot! I’ll have to come up with something really cute for this – I’m thinking maybe a little pillow with black lace trim! Mel said she wouldn’t mind me blogging her gifts long as somewhere I say “Mel thinks I’m inspiring, a fun blogger and is grateful to have met me this year through our blogs!” Well, Mel, I say “back at you” – it goes both ways! Thanks again for such a fantastic exchange! that sweet, sweet, Mel, i was also a lucky one who got a surprise from her. There are so many kind friend we have made here in blogland! Mel "thinks you are a fun and inspiring blogger" and so do I--that is why I read your blog as often as I can! How great are the extras with the cottage block. 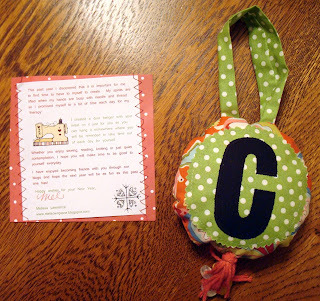 I saw those door knob hangers on Mel's blog and admired them. Love the little bird too. You are so fun Candace! Glad you enjoyed the package! Need I remind you how generous YOU were to send ME the adorable little patchwork bag with the cottage you sent me?? I love the "sanitary" fq. That is so cute! Oh wow! This is so wonderful. Mel is a really neat person. How wonderful. And I can't think of a better recipient than you!